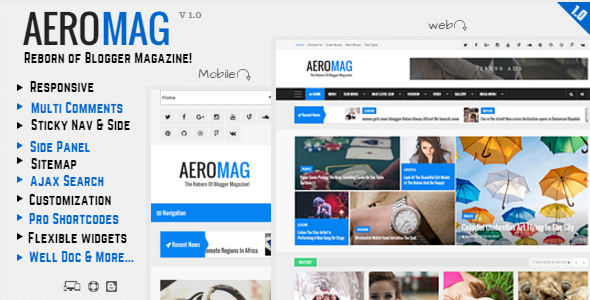 Description: AeroMag - News & Magazine Responsive Blogger Templates is a news and magazine blogger template. It comes with many features such as responsive design, clean and modern look. Side panel, custom contact form, Ajax Search, sitemap and many unique widgets that hardly found in blogger templates. You can use for your magazine, news and blogs. It’s fully compatible with mobile devices. The template is designed with flexible layout, lets user to easily manage their widgets by drag and drop.